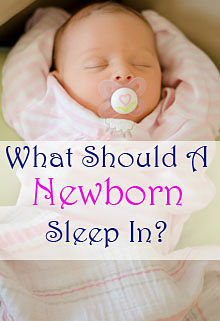 What Should A Newborn Sleep In? Newborns sleep eighteen to twenty hours a day. If you’re lucky, that’s 4-5 hours at a time. What should your newborn sleep in to help him sleep longer? The goal should be to keep your baby warm, comfortable, and snug, in the safest way possible. Here are the basics. There are basically four to six things you should put your newborn in for sleep. Top to bottom, they generally include a set of soft pajamas, a tightly-wrapped swaddler or sleep sack, and possibly a light blanket. Very young newborns might also benefit from a sleep hat to conserve body heat and mittens to prevent scratches during sleep. For safety and sleep training purposes, newborns should also do most of their sleeping in a baby crib or bassinet. Your newborn should wear a long-sleeve onesie or long-sleeve pajamas. Even though it’s cute, don’t let your baby sleep in just a diaper and blanket. Most babies like to have their hands free, rather than tucked in, and long sleeves are important to keep the arms warm. A zipper or snaps will give you access to the vital diaper area. Pajamas with footies are nice if your baby tends to kick out of blankets. Pajamas will also prevent a chill if you have to unwrap him to change a diaper. 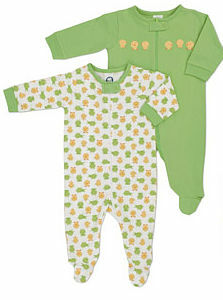 Here’s a two-pack of 100% cotton, zipper-front-closure pajamas with fitted sleeves and footies to keep baby warm. This onesie has a snap closure and is tag-free for extra comfort. 100% cotton and machine washable. 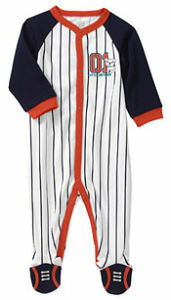 For your little baseball fan, this long-sleeved snap onesie is footed, soft, and tag-free. Machine wash cold. Swaddle your newborn. There is a reason that they swaddle all of the newborns in the hospital nursery. It keeps the babies warm, and imitates the snug comfort of the womb. There are two ways to do this. You can use a regular blanket (Aden & Anais blankets are ideal) and learn the swaddling technique. Or, you can take a shortcut and use a velcro swaddler. 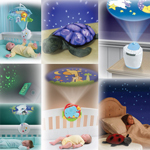 These are easy to use and keep your baby snugged up tight, even if he or she tends to move around. 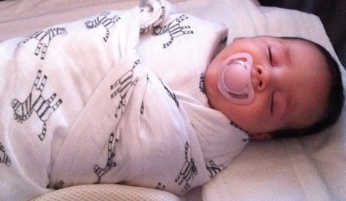 Has your baby outgrown the swaddle? 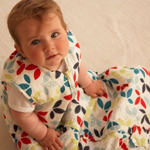 If so, check out our review of baby sleep sacks and sleeping bags for some zippered sleepwear that they won’t kick out of. 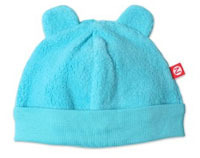 This unisex fleece hat has an interlock band for an extra warm fit and little teddy bear ears at the top for extra cuteness. 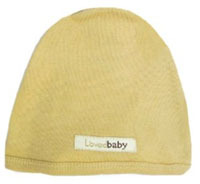 This very popular hat from L’ovedbaby is 100% cotton, super-soft, form-fitting, and comes in a wide variety of colors. Is this not the cutest little Minnie Mouse hat you’ve ever seen? It’s Disney licensed and made of a quality knit. One thing that continues to surprise me is how fast baby fingernails grow. It probably has something to do with their diet of 100% milk plus vitamins. Clipping your baby’s fingernails is an exercise in courage and takes nerves of steel. When your little one gets a little older and can grab at things, you’ll know their nails are long because they’ll scratch you. In the meantime, if you start finding scratches on your baby’s face or head, it was probably self-inflicted while he or she was sleeping. 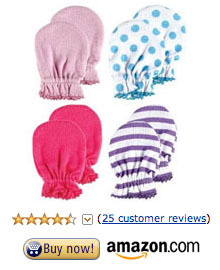 Until you have the time and bravery to trim them, a set of soft little sleep mittens will prevent any more scratches. These are inexpensive and often come in packs of four, which is good because they’re easily lost (in the crib or laundry). Optionally, offer a light blanket. My boys (7 months) like to have a light, soft blanket against their face when they fall asleep. Technically, this isn’t recommended in the APA baby safe sleeping guidelines, but you might try offering one if your baby seems uncomfortable or has trouble soothing himself. Use a lightweight, breathable blanket such as the fantastic Aden+Anais muslin blankets, Tuck the loose ends under the baby securely so that he can’t pull it up over his face. Another point that I should mention here is that your newborn baby should sleep in his or her crib in his or her room (unless you have a bassinet installed in your own room). You should establish this bedtime habit early, when newborns are biologically programmed to fall asleep right after eating. Feed your baby, burp him, rock for a few minutes (if desired), and put him to bed in the crib. If your baby won’t sleep in the crib, see our article on getting baby to sleep in the crib. Looking for a crib that also becomes a toddler bed, day bed, and full-size headboard? Check out our guide to the best 4-in-1 convertible cribs. Even though it’s fun and sometimes convenient, your newborn shouldn’t sleep in bed with you. Not only is it a bad practice, it’s unsafe. A significant number of infants die each year sleeping in bed with their parents. Even without you in it, an adult bed is generally unsafe for a newborn – it has no rails, is high from the floor, and has pillows and loose blankets that present suffocation hazards. For more, see the latest baby sleep safety guidelines. It’s safer, and probably easier, to let your baby sleep in a mini crib or bassinet next to your bed. 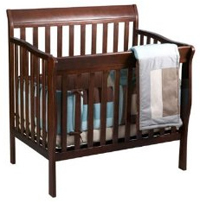 See our mini crib reviews for some recommendations. If you’re planning to take a trip with your baby, don’t forget all of the necessary sleep items! Nothing is worse than getting to the hotel room and realizing that you forgot that critical pacifier or blanket or sound machine. Our travel crib reviews compare some portable cribs and bassinets that you can take along with you.